Do you love the beautiful melodies of classical music, but also are partial to the intense themes of rock songs? If you’re searching for a perfect hybrid of the two polar-opposite genres, then Rocktopia is the perfect experience for you! An entire performance filled with rock ballads and anthems that are known worldwide with well-known classical melodies. Drawing inspiration from the first rockstars of their kind, classical composers like Bach, Paganini, Beethoven, and Mozart, the incredibly talented and passionate musicians of Rocktopia have created seamless hybrids with famous rock bands that have influenced us, such as Led Zeppelin, U2, Styx, Pink Floyd, and Queen. If you’re searching for a unique and showstopping musical experience unlike any other, check out Rocktopia’s tour dates now! The musicians of the Rocktopia tour are thrilled to introduce Máiréad Nesbitt as a guest artist with Rocktopia. Known best for her work with the hugely popular and adored all-female Irish singing group Celtic Woman, Máiréad’s stunning violin skills have earned her rave reviews from fans and critics alike. Appearing on all 11 Celtic Woman albums and recently releasing her newest solo album Hibernia, Máiréad is a talented composer as well as a seasoned violinist, seamlessly intermarrying Irish and Celtic music with Classical themes and melodies. Because of her understanding and exceptional expertise at creating hybrids of Classical and Irish music, bringing Máiréad on as a guest artist for the 2017 Rocktopia tour was a no-brainer. Fans will be thrilled to hear her incredible gift when they enjoy a night with the other brilliantly accomplished Rocktopians. Don’t miss this once-in-a-lifetime musical experience that will leave you breathless and wanting more. Rocktopia was co-created by Rob Evan of Trans-Siberian Orchestra and impressive maestro Randall Craig Fischer. Both founders were passionate about Classical music and had a background in the genre and technique, but they both also adored classic rock. Ballads and themes that were connected to their youth from musical greats such as Queen, Pink Floyd, Styx, and The Who were also major influencers of their art, and they set out to find a hybrid of the two. By creating a perfect mix, the well-known Classical melodies would still appeal to the die-hard devotees, but the addition of the rock lyrics and songs would allure a younger crowd of passionate fans. With that, Rocktopia was born, along with a new era of music. The Rocktopia tour is proud to have six of the best vocalists in the word, five prime rock musicians, and tours with local musicians and symphonies across North America. A night spent at a Rocktopia performance is full of stunningly beautiful Classical melodies and the ballads and anthems of classic rock. You’ll sing, clap, tap your toes, and even hold back tears as you remember songs and lyrics from your youth and memories come flooding back. When you leave a Rocktopia concert, you’ll bring the experience with you and it will stay in your heart and mind. Bring your friends or family to a Rocktopia performance for a night full of amazing talent, gorgeous scenery, and of course, unbelievable music. This one-of-a-kind musical experience will be sure to be a lasting memory for both you and your family or friends. Full of the highest caliber musicians and singers, Rocktopia isn’t only a concert: it’s a walk down memory lane and a fabulous musical adventure for all ages. 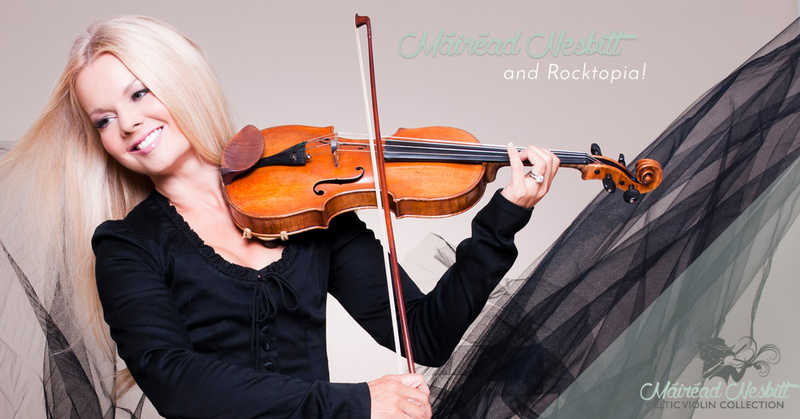 The addition of Celtic violinist Máiréad Nesbitt will be sure to tickle your ears with glorious classical melodies and ethereal Irish tunes that will bring a celestial air to Rocktopia’s musical lineup. If you’re a devoted fan of Máiréad’s but have never experienced Rocktopia, you’re in for a mind-blowing thrill. The blend of the Rocktopia musical repertoire and Máiréad’s stunning talent will inspire and excite everyone who has the pleasure of hearing their collaboration. Check out the tour dates now to see when Rocktopia is coming to your city or area and prepare yourself for a sensational night of music and memories. Tickets make perfect birthday or anniversary gifts, and we’re sure you’ll leap to your feet after the last note and leave wanting more. For more information, check out Rocktopia’s website now and don’t forget to purchase Máiréad’s newest solo album, Hibernia, available on iTunes and Amazon! Máiréad Nesbitt’s Celtic Violin Collection! Máiréad Nesbitt is proud to debut her newest collection of beautiful and hand-crafted violins. Full of beautiful tones and stunning sounds, the five different instruments in the collection are designed for even the most advanced of violinists. In this blog, we’ll discuss the incredible qualities of these violins and how to choose the best instrument for yourself. Please contact us if you have any questions about how to order your violin, and don’t forget to check out Hibernia, Máiréad’s newest solo album! You can purchase Hibernia on iTunes or Amazon today and immerse yourself in the beautiful melodies of both Irish and Classical music. The perfect violin for the beginner, the Butterfly instrument is handcrafted in Romania by expert violin makers. Ideal for students and those who have recently begun their dedication to the craft, this reddish-brown instrument is crafted of European spruce for the top piece and gorgeous European maple on the sides and back. The instrument is outfitted with a German-made Wittner Ultra tailpiece and an Aubert bridge. Using only the best available pieces and accessories for this incredible instrument, Máiréad has chosen nylon core Thomastik Alphayue strings for this particular violin. These strings are designed to maintain their tune, so students won’t be tasked with tuning their violin every time it’s picked up for practice or for a lesson. Along with these accessories, this violin also comes with a durable violin-shaped case that is perfect to transport your instrument to school, violin lessons, ororchestra rehearsal. Máiréad also has included a fiberglass bow, Kolstein rosin, a Kun violin shoulder rest and a Tourte violin mute. Whether you’re purchasing this violin for a family member or yourself, you can be sure that the Butterfly model is perfect for the committed violin student. The Invasion Model is the ideal step up from the Butterfly instrument. Perfect for all types and levels of students, this instrument is also handcrafted in Romania and is varnished in a showstopping golden brown antique finish. Crafted of both European maple and spruce, the body of this instrument is created to last and bring a rich, vibrant, and stunning tone to any piece of music. An Aubert Mirecourt bridge and a German-made Wittner Ultra tailpiece add to the quality of the violin, along with the ebony fittings. For this instrument, Máiréad chose Thomastik Dominant strings, which are known worldwide by violinists as the apex of lasting and rich sound quality. When you purchase this violin, you’ll also receive a protective and strong rectangular case with four bow holders and a hygrometer. If you’re unsure of why your instrument requires a hygrometer, it’s important to monitor the moisture content of the environment and air your violin is surrounded by. If the air is too damp, it could harm the glue and adhesive that holds the pieces together, but if there is no humidity in the air, it could also cause your bow hair to disintegrate or your violin to pop its strings. A carbon fiber bow that will perfectly compliment this style of instrument, Kolstein bow rosin, a Kun shoulder rest, and a Tourte violin mute are also included. Named after Máiréad’s first album, the Raining Up model is an incredible choice for every level of violinist. Full of beautiful, luscious tones, this instrument is handcrafted in Prague by a master craftsman. This violin is made of carved European flamed maple and beautiful European spruce, which will help the instrument to ring with inflection and resonance. Like the other models in Máiréad’s collection, this violin is only outfitted with the best seasoned ebony fittings and tailpiece. The e-adjuster is made by Wittner and the bridge is a seasoned Aubert Mirecourt creation that fits this instrument particularly well. This violin also is outfitted with Thomastik Dominant strings, which are made in Vienna, Austria, and are personally used by Máiréad. Along with this incredible instrument, you’ll receive a rectangular case that features suspension, four bow holders, and a hygrometer. To complement and bring the most sound out of this violin, you’ll also receive a Brazilwood bow that’s ideal for this type of instrument. On top of everything, the Raining Up model also comes with Kolstein bow rosin, a Kun shoulder rest, and a Tourte violin mute. For a rich, deep, and ethereal sound, this instrument is the perfect choice for you. Created for the advanced violinist, this model was designed with a master musician in mind. The Celtic Dawn model is the most similar to Máiréad’s personal instrument that she has played for most of her professional career. Carved and designed by expert luthiers in Prague, this violin is hand-rubbed with an antique oil varnish, giving it a marvelous sheen and drawing out the natural beauty of the wood. The wood is a seasoned European spruce on the top of the instrument and an impeccable European flamed maple used for the back and sides. Assembled with superb ebony fittings, a Wittner E-string adjuster, and an artist Aubert maple bridge, this instrument was made to sing. The violin features Thomastik Peter Infield strings, which are a step up from the Thomastik Dominant strings and bring depth and intensity of sound under the experienced fingers of an advanced violinist. The Celtic Dawn model will arrive with an oblong shell violin case that features four bow holders, a German-crafted Dofler bow, Kolstein bow rosin, a Kun shoulder rest, and a Tourte violin mute. This instrument is the perfect choice to take a master violinist’s art and technique to the next level. This instrument is the apex of Máiréad Nesbitt’s Celtic Violin Collection and is an absolute showstopper. Named after Máiréad’s newest solo album, the Hibernia Model is full of life and beauty, which makes it an incredible instrument for the dedicated and professional violinist. Created in one of the best and most well-known violin shops in Prague, this instrument is rubbed and buffed with an Old-World antique wood varnish, making this instrument just as enjoyable to look at as well as listen to and enjoy. This amazing instrument is crafted of highly seasoned European spruce and maple and fitted with an expertly carved scroll and fingerboard. Along with the seasoned ebony fittings, the Hibernia model is also assembled with a German-made Wittner E-string adjuster and a beautifully seasoned Aubert maple bridge. When you receive your instrument, you’ll notice it’s also outfitted with astonishing Thomastik Peter Infield strings, which feature a wide dynamic range, along with endurance and a dazzlingly brilliant response. On top of this incredible instrument, you’ll also receive a Dofler Brazilwood bow, Kolstein bow rosin, a Kun shoulder rest, a Tourte violin mute, and a rectangular wood shell case with four bow holders. If you’re searching for a instrument that will be a constant in your professional violin career, then the Hibernia model is the perfect violin for you. 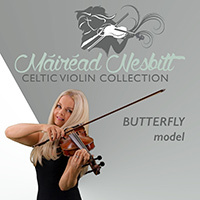 Máiréad Nesbitt’s Celtic Violin Collection is an incredible offering of exquisite handcrafted instruments that are made for violinists dedicated to their craft and their technique. Pioneering both Classical and Irish techniques and music herself, Máiréad Nesbitt is continuously creating incredible music in both composition and performance. If you have been a fan of Máiréad’s for years and are a violinist yourself, check out her new Celtic Violin Collection and her newest album, Hibernia, available on iTunes and Amazon today!